Portable and practical, the Dual Port USB Wall Charger features dual ports to let you charge two power-hungry devices together at substantial speed. 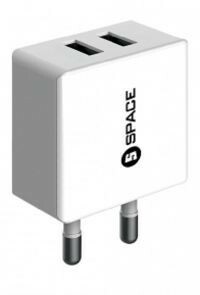 The compact Wall Charger conveniently fits into a small purse or bag with measurements of 43x23x42mm. An attractive output of 5V/2.4A makes the Dual Port Wall Charger an ideal choice for those who own multiple USB-powered devices. The included Micro USB cable with the Wall Charger is another handy add-on. Safety for your device is guaranteed with the Dual Port Wall Charger's high-grade construction. Two ports let you charge two phones and/or even two tablets together at top speed. The compact charger fits comfortably into a small purse or bag. The included Micro USB cable is another useful add-on. Engineered with high-grade materials, the Dual Port USB Wall Charger meets global safety standards.